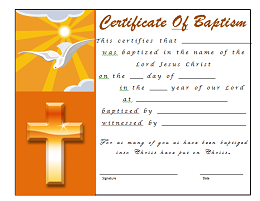 Free Certificate of Baptism to download and print at your convenience. This certificate is a wonderful way to recognize a Baptism, and to create a treasured keepsake memento of this, one of the most important events in one person's life. Having this special certificate is a constant reminder of your faith in our Lord Jesus Christ. This is a day that you will never forget and you will always look back at so this certificate will help you remember the very date of this very special moment. This certificate states "This certifies that [Participant's Name] was baptized in the name of the Lord Jesus Christ on the [Date of Baptism] in the [Year of Baptism] year of our Lord at [Church Name] baptized by [Person(s) Who Baptized] witnessed by [Witness Name] - For as many of you as have been baptized into Christ have put on Christ. - [Authorized Signature and Date]. Christian baptism, according to the Bible, is an outward testimony of what has occurred inwardly in a believer's life. When you perform a Christian baptism this illustrates a believer's identification with Jesus Christ's death, burial and resurrection. Romans 6:3-4 states "Know ye not that so many of us as were baptized into Jesus Christ were baptized into His death? Therefore we are buried with Him by baptism into death; that like as Christ was raised up from the dead by the Glory of the Father, even so we also should walk in newness of life." Your church administrative office will be pleased to own this certificate for free to have available for every baptism to give to the person(s) who is accepting Christ as their Savior. This certificate can be printed on various forms of paper such as resume, stock or even plain copy paper depending on which you prefer and which color of paper you prefer. It can also be inserted into items to help preserve this memento such as a beautiful picture frame or even just simply a sheet protector depending on how you want to present it. If your church participates in baptism, you might want to download the certificate below. Return to Church Certificates from Certificate of Baptism.